Decade as a whole - CO2 concentrations rise from368 parts per million (ppm) in 1999 to 387 ppm in 2009, an increase of 19 ppm: 5.2%. 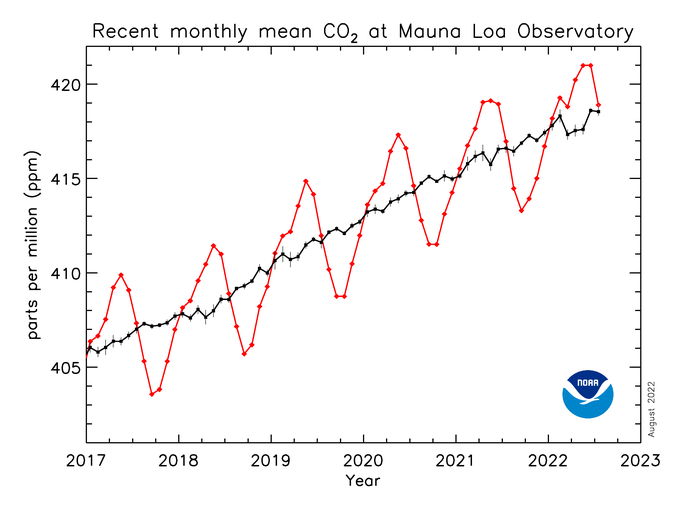 During the last ten years, the annual increase in CO2 concentrations has accelerated. Every single year of the '00's, the annual increase in concentrations has exceeded 1.5 ppm. In the preceding 40 years since records on Mauna Loa have been kept, that had only happened nine times total. CO2 concentrations are now higher than they have been for millions of years, and they continue to increase unabated. The International Panel on Climate Change (IPCC) warns that concentrations above 450 are likely to result in average global temperature increases of 2C or more--a level at which dangerous tipping points in climate may be unstoppable. Many experts believe that slowing emissions of greenhouse gases enough to stop concentrations from rising above 450 ppm is already verging on the politically, socially and technologically impossible. Yet some scientists--most notably James Hansen of NASA--have called for reducing CO2 concentrations to no more than 350 ppm.